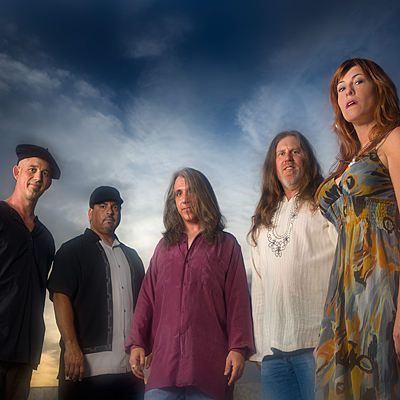 Phoenix, Arizona – October 1, 2009 – Born in the desert, Dream Chemistry sets a new direction for guitarist, Jimmy Caterine (Sacred Rite, Caterine), along with co-musicians/writers- Neal Harris (bass), Michael Mulryan (violin), Ella McGee (vocals), and Tito Valentin (percussion). Formed in 2007 by Jimmy Caterine and Neal Harris, their original concept was to organize and perform at benefit functions and help raise money for several worthwhile causes. They have helped raise money for Eve’s Place (a safe house for women) www.safetyatevesplace.org , The Angels on Earth Healing Ministries (volunteer community outreach) www.theangelsonearth.org , the Merritt Center (specializes in programs for soldiers with PTSD) www.merrittcenter.org and Homes of Mercy for Children www.mercyconnection.com . Dream Chemistry will be available on October 1, 2009 at www.DreamChemistry.com and www.Caterine-Music.com through Caterine Music/Musical Chemist Publishing followed by a release at all the obvious places that carry independent music, including CD Baby, Amazon and iTunes.